Hello, and welcome to Spruce Ridge Farm! Thank you for visiting our website. Comments Off on Spruce Ridge Farm Launch! 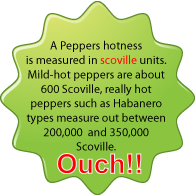 Most Peppers are extremely rich in Vitamin C- a single pepper has more than a cup of orange juice.